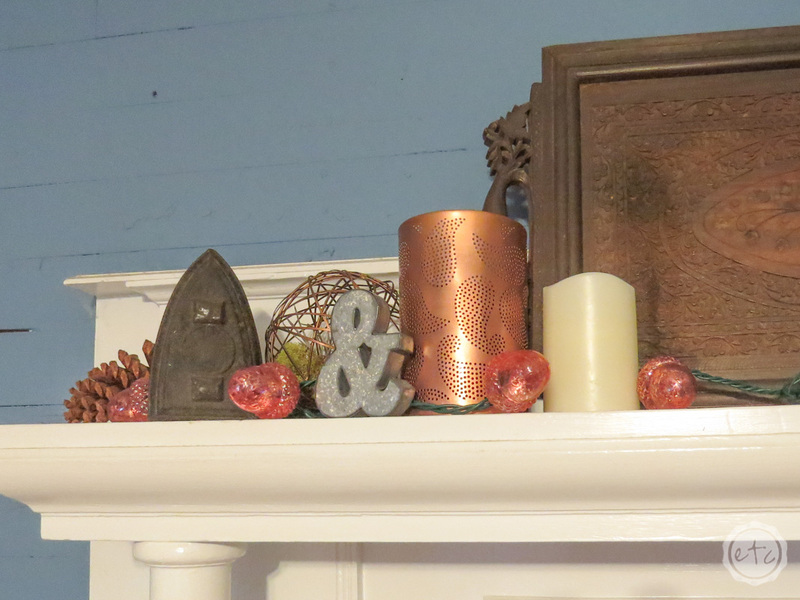 Quick and Easy Fall Mantel Decor - Happily Ever After, Etc. This week I find myself, like so many of you, suddenly thrust into fall! I’m fairly sure it was just the middle of summer so I’m not sure how it happened! Either way it has and when I found myself suddenly working on a fall mantle that I was woefully prepared for. It’s the middle of summer in my mind after all! 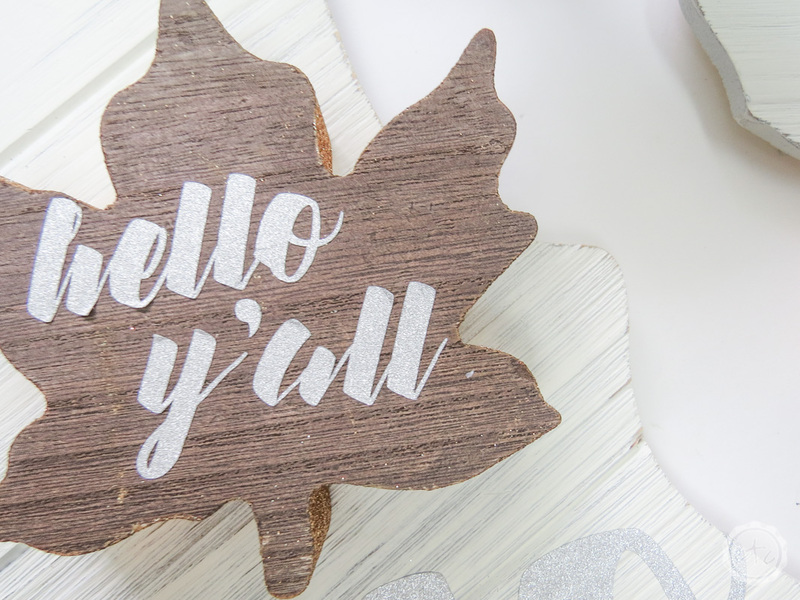 But summer has suddenly turned to fall and therefore we need a few fall decorations! 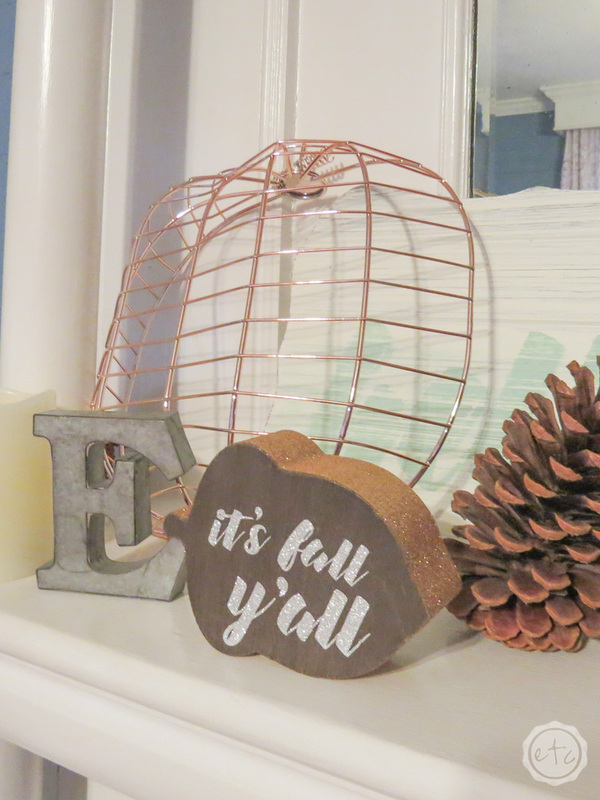 Luckily I did whip up a couple fall decorations a few weeks ago with my cricut so I know where I’m starting for this little mantle: leaves, nature, neutrals and of course…. copper. 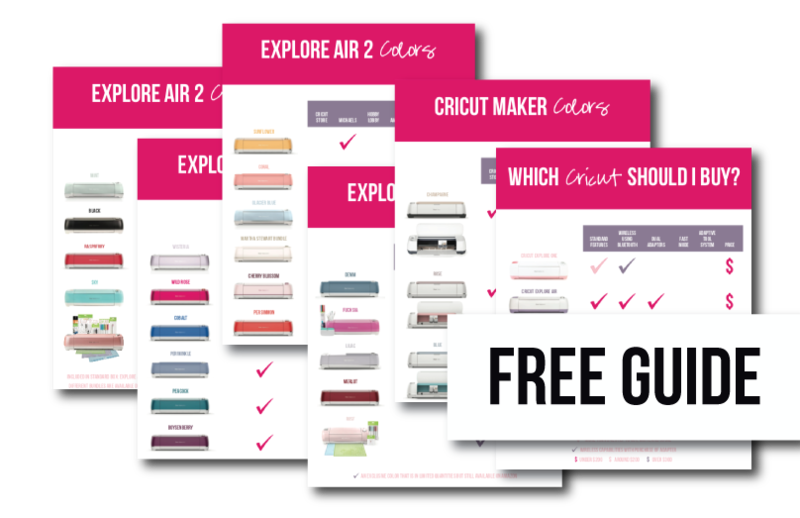 Of course, if you’re looking for even more fall mantle decorations just scroll to the bottom of the post. A few of my friends are sharing their mantles as well! It’s hard to tell because this little guy is looking straight at you but the entire profile is covered in copper glitter! 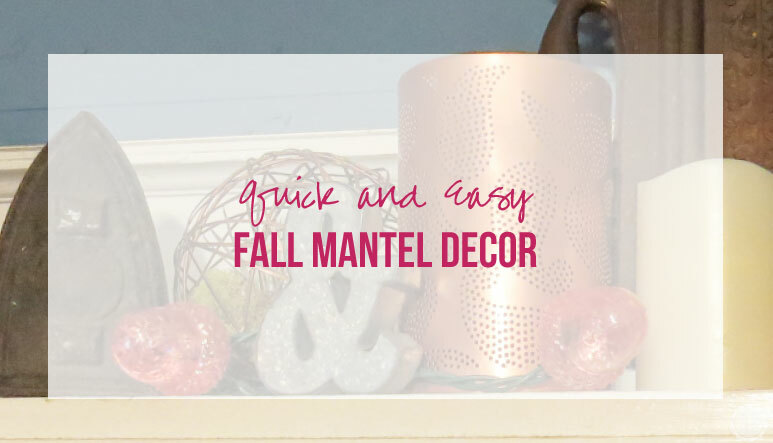 So here are my top tips to creating a fall mantle quickly and without much notice. Number 1: Find a few Fall Pieces to Center your Mantle Around. 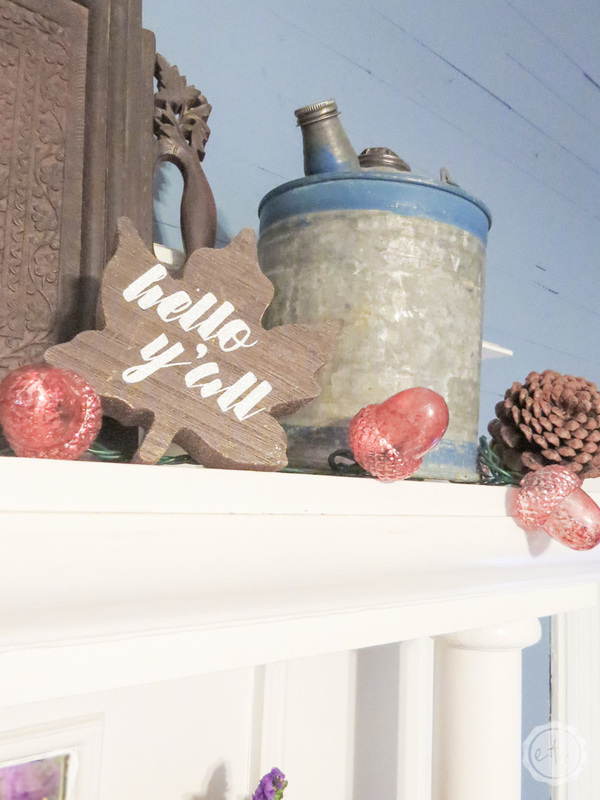 For me that was the “hello y’all” and “it’s fall y’all” little leaves and acorn that I made a few weeks ago. They’re the perfect touch and definitely scream fall… I mean one of them even says fall right on it! When you’re working quickly and don’t have a lot of items to play around with flowers are always a great solution. They’re inexpensive, come in a billion varieties and add life to your mantle. I asked Mom to pick up “fall flowers” at the grocery store so this little bundle of sunflowers and roses gave me a much needed pop of life for just a couple dollars. Alright so now we have our brown and copper little pops of fall. So it’s easy to add a few copper accents like the large copper apple basket, copper acorn lights and copper candle holder. Of course, these were all things I had on hand so your list might look a little different. That’s ok. Try to add items in groups of 3 and stagger them around your space in a triangle like format if you can. That will allow the eye to bounce from item to item creating movement (and making your little copper items seem more plentiful!). Of course, since copper is such a big loud powerful color I chose to keep it simple and only add a few copper accents. For the rest of the mantle I added things like a large serving tray, a small galvanized ampersand, a galvanized can… an antique iron. 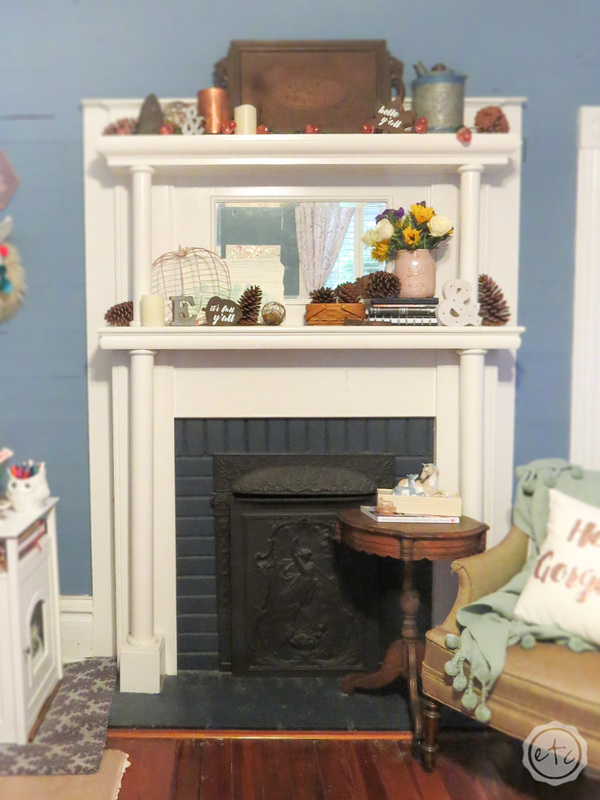 Things with the same color scheme or feeling as the rest of the mantle. We’re on the last step! Now that our mantle is all but finished we’ll add in a filler to tie the whole thing together. 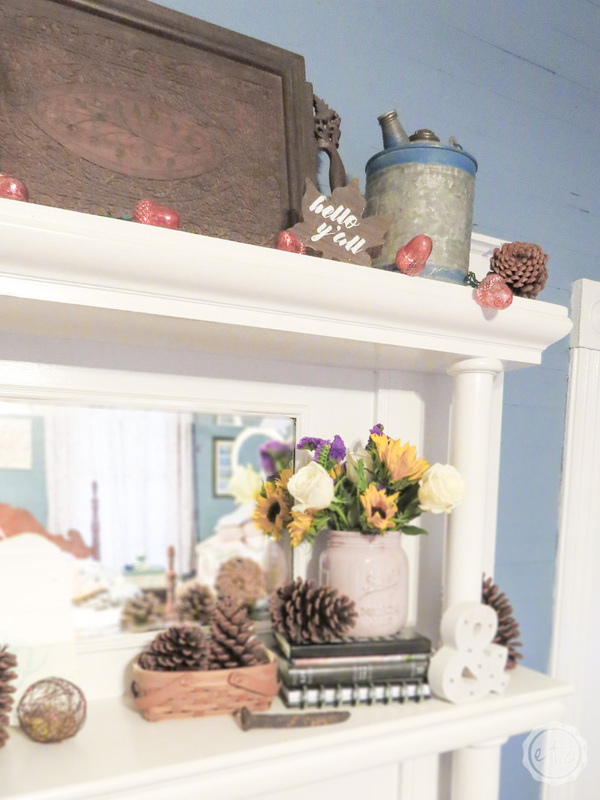 I went with pine cones since they’re free, perfect for fall and match our color scheme perfectly. Of course, there are plenty of other items you could use: white candles, small pumpkins, leaves, etc. 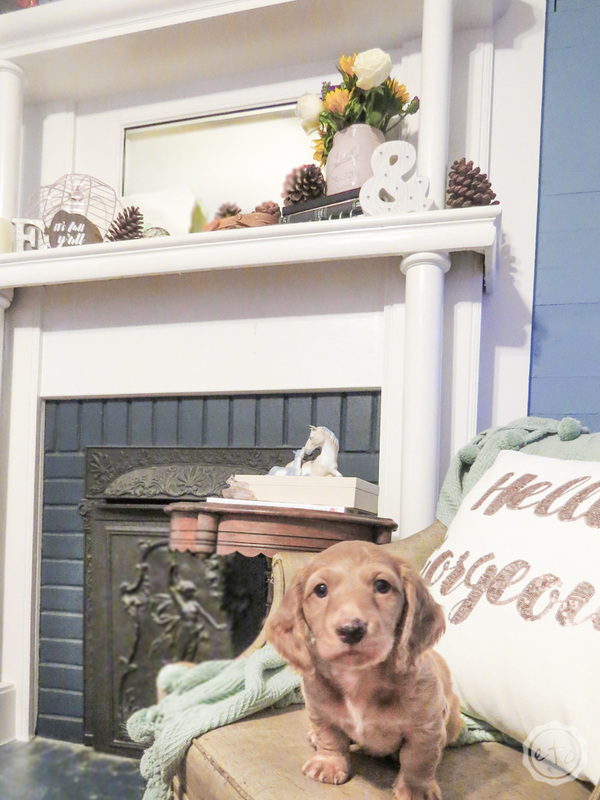 All in all, I’m happy with how our little fall mantle project turned out… and so is Mario! Ready for even more mantles?! Bring it on! So pretty! 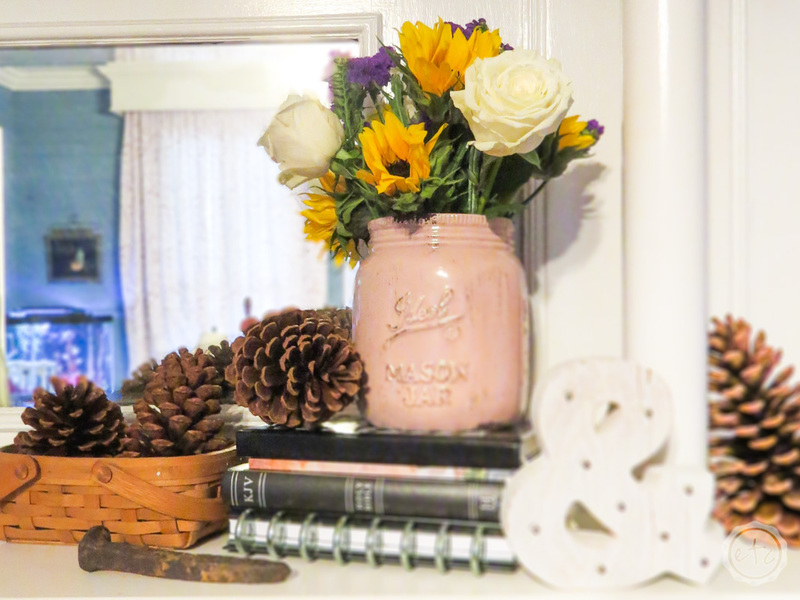 I love your tips – and I love the pinecones. Those are a fun addition. Love the pinecones and pops of copper! It’s looking a lot like fall over there!! Wow! 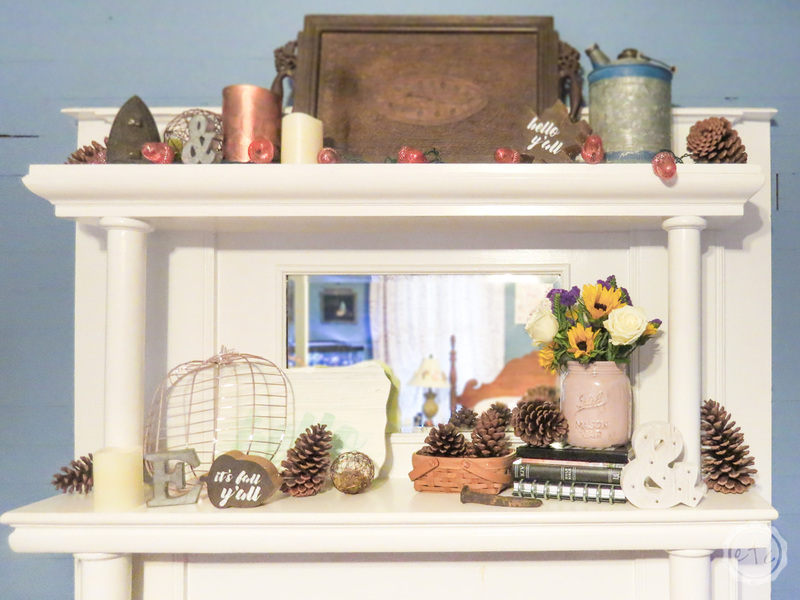 Your mantel is stunning and you’ve made it look perfect for fall! I love the flowers – they added such a pretty and colorful touch.